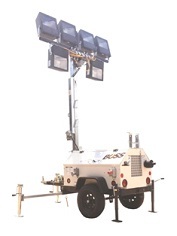 PORTABLE 50 FOOT MINI-ULITMATE STADIUM LIGHT TOWERS EIGHT FLOODLIGHTS are used where the application calls for minimum illumination to be projected over a larger area. This type of project is designed to where four lights can be aimed in one direction and the other four light to the opposite direction. At 50′ above grade these eight lights will take the place of 3 to 4 commercial 30′ light towers. Project savings on reduced amount of fuel required, less number of tower to start stop each day and few down time hours with servicing 3 to 4 towers compared to just one 50′ tower. These PORTABLE 50 FOOT MINI-ULITMATE STADIUM LIGHT TOWERS EIGHT FLOODLIGHTS are available with LED or Metal Halide fixtures. 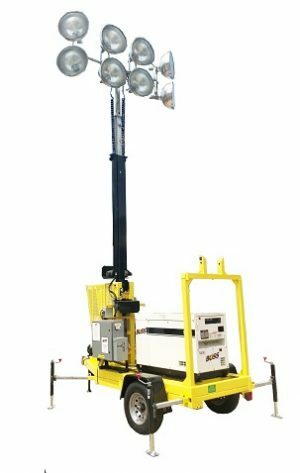 The 50′ tower has auto stop at 50′ with auto boom lock so that tower cannot lower if cables or winch system is compromised. Auto stop at lowed nest position to prevent cable back-lashing on winch drum. This 50′ tower also has high wind speed monitoring. Auto lowers towers if winds exceed 45mph. There is a RED beacon light that will flash whenever the tower is in motion to alert crane operators on site.